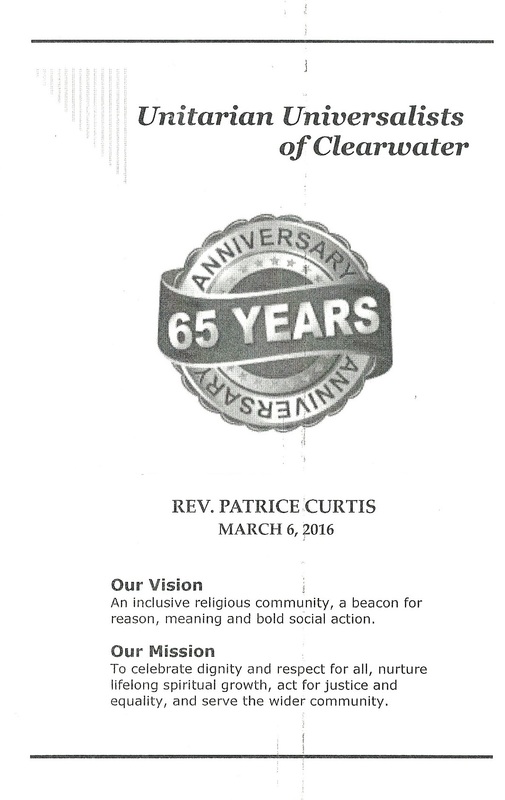 I attended a Sunday Service and Naming Ceremony at the Unitarian Universalist congregation in Clearwater last weekend. It was an interesting experience. At the door, they give you a little program of what the service will contain. Below you will see the front and back page. I include it here because it gives some idea about the beliefs and practices of the “UU’s” (which is how they refer to themselves). It was their normal Sunday Service. About 250 people were there. Their church was built from scratch, funded by donations from members. It is functional. Unassuming. Certainly NOT opulent. Though I would bet they are generally well respected and loved by their neighbors and the local community. They go to great lengths to make newcomers welcome. You really get a sense that they are happy to see you and are genuinely interested in you. They are completely non-judgmental. People of any faith, color and sexual orientation really are welcome. It is not just a platitude not born out in reality. Their “pitch” for money is to let you know that contributions are welcome to help them with their programs, currently focused on supporting refugee families from Syria and Afghanistan they are sponsoring. No hard sell for anything at all, just very interested, caring people who want the world to be a happier, kinder and more harmonious place and believe that by encouraging people to act that way they can bring about a bettering of the state of things. They sing nice hymns, have a piano player and violinist and a choir, but everyone in the congregation heartily sings along. No “We Stand Tall.” Messages of hope for the world. Something that really makes a gathering place feel like a religion. Things remain light-hearted. A lot of laughter and humor is incorporated into their service. They socialize afterwards — coffee and snacks. Everyone participates with a lot of social interaction. Nobody trying to get your money. Nobody standing at the door refusing to let you leave. No “pass the pen.” No Big League Sales. No big display of books you are supposed to buy. But somehow, they are doing a better job of attracting followers than scientology is. I am certain it is because people are made to feel welcome, not feel like “marks.” I guarantee the two missions in Clearwater combined didn’t have 1/10th the number of people at their Sunday Services. And the UU’s don’t buy national TV ads, or spend millions on internet sites and PR videos and PR press releases and click farms. I am no doubt biased, but I am pretty certain that if Oh No Ross and Carrie went into the UU church for a while they would have little to comment about. Unlike their experience in scientology. And that about sums up the difference: humanity. Scientology has lost any sense of it. And though they like to announce loudly and often what great humanitarians they are (and try to do so to the world until they are prevented from continuing to lie about their accomplishments), a simple exercise such as this exposes scientology for what it really is. A scheme motivated by the desire to extract maximum dollars from anyone it can get its hands on. For ex-scientologists, I believe it is a valuable exercise to visit such congregations. I understand the Unity church is very similar. And for some it might even open the door to a group you would enjoy participating in (as the loss of “community” when everyone in scientology disconnects from you can sometimes be difficult). I am not promoting anyone to join up, just sharing my experience. I suspect many, like me, are done with any form of organized religion. But this is where I would head if I felt the need for some sort of group experience. Mike, I’m so very happy for you and your family. To go from being in a controlling cult, an organization that is only interested in your $ & is emotionally & physically hurting you to finding an actual “religion” that is there for you and so very welcoming is very exciting to hear! I have watched Going Clear and you interviews and I saw the pain on your face when you and Tommy were on Panorama. You look so much better and you can just tell how happy you are now. I pray that you continue to live a happy & peaceful life! You are a great inspiration to many especially me. Stay strong and keep moving forward!! Hmm this reminds me of my work with OSA/DSA types. They view these “other religions” as other practices even going so far as to call them squirrel. Yet the other hand is trying to forge alliances with people like this for the sake of “me too” in the local community. In other words, I’ve personally witnessed Co$ staffers use their connections to these other groups to gain some cred in the local community while internally placing the religions themselves no better than “squirrel”. Mike, thanks for sharing this positive experience with the UUs. In my experience the CoS used to be like this. 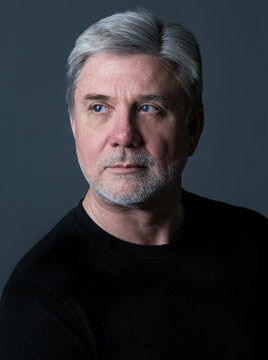 During my first year in Scientology when I was beginning to confront some difficult and painful experiences that I had long buried, I was having a rough time and was frequently in Ethics, but no-one was perjorative in those days. I liked the Ethics officer very much, if you can believe that, and the other staff were all friendly, gentle and encouraging of me. I recall one time when I was waiting for the EO to be free. Boy, was I a mess, due to remembering something; I’ll leave it at that. I sat waiting for her and I was crying and trying to hide it unsuccessfully and totally embarrassed that I could not hide it and could not stop crying, so I was miserable AND mortified. A staff member approached me and asked in a casual way if I would like to eat all the Chinese food she had just ordered. She had to go out of the org or something right away.and she didn’t have time to eat it, she said. Now, as it happened, I was also quite hungry because I hadn’t eaten anything that day – too upset, or whatever. “Really?, I asked. I can’t take your whole meal like that”. “Please do, she said, “because it will just go to waste as I must leave immediately”. She was kind, yet brisk, and she seemed not to notice the teary red eyed, stopped up nose mess that was my face. She brought me the Chinese meal and hurried out the door, and I wolfed that it down, and nothing had ever tasted so good. To this day I remember that, and how good it felt to be the recipient of a simple, spontaneous act of kindness and generosity like that. I remember how she handled my upset by serenely and tactfully ignoring it. I wish I could remember her name because I’d actually like to reach out and thank her after all these years. This brief incident had a big and longlasting effect on me, believe it or not. It reflected VERY well on the organization of which this staff member was a part. interesting comparison: next time try a Synagogue! The OT8 Wasband was born Jewish. He rarely attended services @ the Synagogue; and when he did he sat there with a sour expression. BECAUSE: He is brain dead as a cult member in Scientology. Nothing else can provide him with satisfaction. I went to the UU for years after escaping the cult and it’s great to see that many others have done the same. The UU’s helped me a great deal. After the cult, I needed a nomalizing group. This particular church had fantastic music and an incredible pastor so I kept going back. The UU’s are all about respecting the beliefs of others. They also believe in the ability of the spirit to revive. Scientology has a lot more in common with a dance studio selling new dance steps, but extremely seriously. Hubbard’s greed and narcissism and paranoia and need for power shattered the dreams most of us exes had. That’s a terrible karmic game. Hubbard’s message was not friendly, not humble, not loving and certainly not respectful of the beliefs of others. And he spread that message. And I’m still recovering. Thank you, Mike. I was ordained in the Universal Unitarian Ministry in 1996. Even though I have not been an active member of the Clearwater Congregation (in fact I have not even visited or attended services there for over a decade) your experience is a pleasure to hear. I am glad to hear that they are have remained true to what our faith is all about. The focus traditionally has always on the Spirit of Mankind, helping everyone find their own Truth, and bringing people closer to the Creator, or Creators. This is a wonderful thing for me personally to read. Whatever your path, where ever you find your encouragement and peace, I am glad you had this experience. Hi cathy du pont, Good to meet you. Thank you for posting here. I was married by and have known the Rev. Carl Scovel,a now retired brilliant soul at KC He married hubby and I @ King’s Chapel in 81.KC was a big part of mry early growing up years.Definitely one of the white hats and hearts.Thank you for what you do to help all.Always,Ann. I remember a Briefing Course lecture where LRH made the point that when you find yourself in one of those sessions where nothing is working and everything is going to hell that you should just let your humanity take over. That seems applicable to the entirety of Scientology today. didn’t he also say something like “one has has to run scientology out”? There is a thriving UU Church in my City and members are very active and well known in the community. They are a welcoming congregation and allowed Scientologists in the late 70’s and 80’s to use their Sanctuary for weddings, christenings and funerals. I went through their 6 week orientation (one evening a week for 6 weeks) and attended for a few years, but then wandered away due to own ambivalence about religion in general. No one called me to get me to come back or threatened me or judged me for not attending. They seem to accept the fluidity of their congregation, though the services on Sunday were packed. If people feel belonging to a religious group helpful, then this is a very safe environment. The Church is not new. Some of our Founding Fathers were Unitarians / Univeralists. It was in a Unitarian Universalist church that I first found my introduction to eastern thought. Across the street from Central Park in 1969, a brown man wearing an orange robe from India would back the place every Friday night. 400 seat capacity. How wonderful and eclectic that I learned my life’s purpose from a Yogi teaching in a Unitarian Universalist church. Very nice description, Mike. Thanks for sharing this. In my original org in 1973-1977-ish it was very similar. There was a little bit of “routing to the Reg” and some big league sales, but only in the Reg office with a person who willingly went in there to discuss services for themselves. Everyone was free to leave or mingle after Sunday Service. Sometimes we’d have live music and cupcakes or cookies and coffee. A few staff were around to find interested people and try to get them on a Comm Course, but it wasn’t grossly hard sell. And we were growing. This isn’t even “tech” or “policv,” but it should be: Figuratively speaking of course, but you attract more flies with honey than you do with vinegar. Or gestapo/mafia control. My personal take on this…….. when all is said and done……. Hi Mike Moretti, I am working and trying hard on all three sensitive points you made.It is hard at times, but worth it.Thank you.Starlight,Ann. C’mon Richard! Bummer is a perfectly fine word! So is bitchin’! As I grew up in the 50s and 60s, I used those words all the time. Including ‘right on.’ And I often speak like this: “Dude! I was so in the barrel of this 6′ spinning tube, that I thought I’d never end!” So, Richard, speak your mind at anytime…. Bummer: It’s not just for acid trips anymore! Gnarly dude and bodacious. Cowabunga! Far out… like cool man… Dobbie Gillis and Maynard… Gilligan who? Back in the 1970s, the scientology community in Ann Arbor was like that. I recall going to a scientology wedding at the local UU church hall. Randy Faber played the piano, people were friendly and laid back. “Gone are the days, my friend, we thought they’d never end….” There is, fortunately, a good sized UU community here still. Right on Mike. After I investigated and discovered the actual extent of lies and retaliation against whistle blowers who were exposing Scientology related crimes abuses and financial fraud in late 2006, I started working as an audio engineer in local churches. Mainly “New Thought” churches. I was almost startled at the level of participation that these churches get from their congregants. (Unity, Church of Religious Science-Ernest Holmes) I came to the same conclusions as you, that there are people out there looking for a spiritual community who find a home in places like these. These churches (like the one I work at) have leadership that is closely tied in with the leading spiritual leaders, movers and shakers and philosophers of our time. And I mean the top. There is a tide turning towards the New Thought Movement as people are finding that traditional religious practices leave them feeling unfulfilled. My conclusion is that Hubbard poisoned his own well. The paramilitary style full-retail self help bait and switch operation that is the Church of Scientology is TOTALLY irrelevant compared to what is really happening in the New Thought movement in America today. Scientology is totally missing out on the very real need and demand for an alternate effective and inspiring spiritual community and this movement is growing. Scientology is so laughably inappropriate and unreal considering the reality and economic means of people today, that their continued persistence alone deserves the vitriol they get in the press. Scientology should immediately cease all “overt acts” and come clean, make financial restitution and then close their doors as a first step of real amends. Release all trademarks and allow the free market to have it’s way with whatever aspects of Scientology prove useful in carrying forward. Well put Doug. Thanks for that perspective. My parents raised us in the Unitarian Universalist church because they had both been damaged by fire and brimstone Catholic upbringings and had rejected dogmatic religion, yet wanted us to have some exposure to good people and good deeds that could open a door to spiritual life for us, if we wanted that as we grew up. It is truly the greatest thing they ever did for us. The Unitarians are most interested in promoting fellowship and inclusiveness among all people, and they are very active in movements that promote social justice – they put their money where their mouths are. The church exposed us to other spiritual disciplines as well to try to demonstrate that there are many paths that lead to spiritual wellbeing – and they all embodied kindness and respect for others. This was amazing stuff to see when you’re 8 years old! I believe that what my parents did saved me from the prospect of any real damage by mind control cults, even though by nature I was as innocent and gullible as any other kid or teenager. I still got taken in by pretenders in my personal life, I also bought into the worldview promoted by existing political and power structures (for awhile anyway) but in adulthood I was able to let it all drop to the ground and form my own real view of the world based on what I observed. The downside is, my world view now is much worse, much darker, much more cynical than what it might have been if I had been co-opted by a cult and accepted the bubble mentality they promote to keep you unaware of your surroundings. But I’ll take that medicine any day to live an authentic life. The world’s structures have become very corrupt, but I believe all the way down to my toes that there are more good, well meaning people here than those who want to control us. I believe that good people and good will towards others will always prevail. A moving comment Alice. Thank you. Mike, I read your blog every day, but travel way too much. Connectivity, time zones, wreaks havoc with stability. I comment way less than I would like. But I had to shoot off this quick comment. This is such a great article. It juxtaposes the ‘church’ with this beautiful scene you describe. The quality and thoughtfulness of all the comments is inspirational. It’s funny, a thought I had reading your piece, the church is facing the past with its back to the future. It is looking backwards, it’s methods, policies, comm-evs, sec checks, KRs, voracious sales face-ripping. Its structure and organization, the lot. The UU experience and those similar quoted by others, faces the future, right way around. So refreshing and genuinely instills a modicum of hope in a sad-ish soul. Dear Subreption: Sorry I didn’t get back to this site until today – but want to respond. Bless your heart. Many of us are very weary souls, and the solution to our tiredness is to reconnect with good, loving people. They can be found anywhere and everywhere. But if you want to find a place where you don’t have to do much investigation to find out the quality of the people there, just go to your nearest Unitarian church. They are truly some of the most loving and well meaning people on the plant. We’ll all heal ourselves, if we stick together. Much love to you. Just being nice, having good manners, showing genuine interest in the well being and activities of others is what spiritual gold is all about and is the first step to getting anything meaningfully done by or within any group. Camaraderie is generated by many religious organisations and produces good will and wonderful experiences but is treated within scientology as an ‘easy mark’ vulnerability and is preyed upon until it is extinguished and replaced with a kind of robotism. Scientology has relentlessly pitched every button of human emotion for extracting money and returns nothing. It leaves behind a bitter experience and a sense of loathing, hard at times to come to terms with, especially when family members are still walled off inside. Nothing good comes from being a member of the church of scientology. It is a church dedicated to the dominance of its members for money & servitude, nothing else. What about the MeMes? Or, the YoYos? Don’t they deserve a seat at the table? Baptists however sit outside at my pick nick table. Welcome to scientology’s sunday service, will that be cash or credit card? Will that be cash, credit or, will you be handing over your child to the Sea Org? Hi OSD,, However will I choose? OK the two kiddies I could not have this lifetime -well cuties Sea Org it is! XO Ann. Just last year for Easter , some new friends asked us to join them for service at their church , their son being the preacher. It was too soon for me , I could barely breathe , felt trapped and unfeeling in the midst of lovely people. And that’s the result of too many years in the cos , where walking in an org meant you could be assailed by an overzealous staff member and would automatically hide within yourself to not lose your money, your life and everything you hold dear and all the while wondering what kind of hold they had on you to provoke such a reaction. Since then I have experienced what you describe in your post but more interestingly I have seen it in my husband , his face relaxing , a smile that won’t go away , the wonder of rediscovering that people congregate for the pleasure of it with love and interest and no need to hide. Organized religion is not an option . I have family members who don’t want material gifts at Christmas, so I’ll make donations to the Mennonite Central Committee in their names. The money goes toward things like providing seeds and livestock for farmers in the developing world, or maintaining wells and cisterns so people don’t get sick from contaminated water, or giving school supplies to children in need. Excellent Mike. I have several buddhist friends who are ALSO members of their local UU church. I heard the first UU minister (not sure if they call themselves ministers) several years ago when I was attending a buddhist retreat in Cooperstown NY (home of baseball hall of fame). The VERY Tibetan Lama had invited a local UU minister to speak to those of us gathered. About 50. I was amazed and happy to see this very open, non-judgemental and very non GOD speaking person. And because it’s my nature, I checked out a great deal about UU and how it came to be called UU. ANYWAY — what troubles me is that some of my former SO friends were so badly burned by the SO, Scientology and Hubbard (and now Miscavige) that ANYTHING remotely “spiritual” is ignored, made less or and just denied. IF you can’t see it, touch it etc — it’s just discarded out of hand. THAT said — there is something quite wonderful having a community that really IS welcoming and warm, compassionate and helpful — and not pushing a religious/non-religious dogma down ones throat. Hi windhorse, Another wonderful post from you.Thank you. I loved your comment about spirituality as regards those who have been badly burned by Ron and dm and/or Sea Org/ staff.For my situation I would have to say the bad burning I got from cos, actually looking now, made me much more interested in things of the spirit than I ever was before.I most probably will not be an organized religion person, but I respect those who are into theirs.I am a square peg who my whole life was made to try and fit in a round hole.Even in Sea Org.Now I try to live, laugh love & learn! Love,Ann. 1. Discover and learn LRH’s tech. 2. Use it to see and learn the kind of group a Church of Scientology is. 3. Leave the church (if one joined) or stay out of it (If one didn’t join). Then….new religious pioneering can be on the main course of everyone’s menu. Lawrence I really don’t understand what you are saying. Sorry to be think but I really am not understanding your point. Thanks for being willing to elaborate. “We are playing some minor game in Scientology. It isn’t cute but it’s something to do for lack of something better. Mike, I am a proud member (for 11 years now) of UUC and I cannot thank you enough for this blog. We are coming out of a time of upheavel and discontent, into a new, glorious time for us. THANK YOU for the encouraging words,that we are, infact, doing something right! Thanks for visiting and your comment Peggy. I’ve very much enjoyed my UU church going as well. Also the Church of Religious Science – wonderful groups of people (and great places to meet Scientologists who have washed their hands of that subject). Mike is right; these are good places to go for community, and to meet lots of people who “speech/talks” “speech listens” above 3.0 on the tone scale. Dan, my wife and & I were married in the Church of Religious Science. Those in attendance said it was the best ceremony they had ever witness as the pastor was quoting from many, many famous people who had gone before us. NOT JUST ONE PERSON WHO WAS MENTALLY ILL.
You know what else Unitarians don’t have? An owner. OMG!!!!! You mean to tell me they don’t have the magnificence of a DM or an LRH as their owner??? How do they congregants know what to do in the absence of a dictator? Mike, great blog. The comparison of the cherch to a real contemporary church is quite dramatic. The Borg society, or body snatchers pod people as opposed to the Unitarian church is how big a contrast there is for me regarding the cherch. I still remember in Body Snatchers how they all start screaming and chasing Andrew McCarthy when they discovered he was not one of them. Probably one of the most scary film moments for me as a pre-adolescent. Scientology is like that. They use knowledge reports and security checks to scare their members. Once one is declared they(Sciebots) normally run away from the “SP” or send Seaborg troops to attack them. When looked at objectively Scientology society is truly dangerous and destructive in its results. Mike your blogs provide a very objective point of view even though you also state your personal opinions. Thanks again for another enlightening blog. I know married of people having become “unitarians” before becoming scientologists. As well as I know people having been catholics, or protestants, or atheists, having becomre scientologists. The problem is that education does not train kids to understand logic, and to be able to see insanities from wherever. That some cults or beliefs are worse than others won’t avoir any belief to have lots of ineptitudes Inside. Things have changed over the years in education. Ideally, education should teach critical thinking across all subject matters. But such a curiculum is expensive, time consuming and requires more of teachers than now. It can be done, but there is little will to push for that except at some local level. Teaching critical thinking is one good prevention against cults. It is not a guarantee. Eclipse-girl, ironically, what made me go UTR in the cult was one of its own courses, the Data Series. No-one regged me for it; I originated that I wanted to do it, and the staff in my org did their darndest to discourage me from doing it. I insisted, though, because I had read the Data Series PLs on my own time and I was intrigued and wanted very much to do the course. This is anecdotal but for me it was like paying for a ticket out of there as it woke me up and made me LOOK and whoa, the outpoints I observed were legion. Its no accident that Co$ has stopped promoting, selling and delivering this course. You have got it right! Critical Thinking is a skill everyone who wishes to keep their mind intact should study and practice. It is the most effective BS filter I know of. AND you can get most of the principles free on line or pay the enormous sum of $6 for some focused booklets! Harry, I seem to recall that you were the president of WISE at one time? You’re probably right. I know I ran across Harry Weidlich at some point. When you finish high school here, if you plan on getting a bachelor’s degree, you need a 2-year pre-university degree in the broad discipline of your choice (science & health, language or social sciences). I did it with a special curriculum called the International Baccalaureate – I think it is also offered in some high schools throughout the world. No matter what sub discipline you choose, they have a mandatory class called Theory of Knowledge, which is a sort of mix of philosophy, epistemiology and logics. They teach you the basis of the scientific method, how we can know things, the limits of our knowledge and different logical fallacies. We were all young adults, at an age where most cult victims are recruited – the perfect time to be taught such things. If I had anything to add to it, it would be covering coercitive persuasion techniques. This should be mandatory teaching for all young adults before they head for college or employment. To become super-human you have to leave your humanity behind. Unfortunately the compassion, passion and dismay of being human is all that you really have. When you have left that behind, when you have surpassed humanity to stretch forth your hand to grasp the divine, it is more likely Satan’s grip you feel than an angel’s. Angels love you as you are. The dream of the Uber-mensch is actually a nightmare, bereft of humanity, drenched in the nihilistic fervor of inhumanity. It is the concept that a human can become an elite being, can have concerns that trump the petty needs of mere mortals, that the ends justify the means, that make earth hellish enough to pass for the real Hell as Hubbard famously observed. Hubbard made it worse by promising that a human could become homo novis. Homo Sapiens is what we are, in all the glory and messy striving that it is to be human. Let us not disconnect from our fellow humans, friends, family, associates, countrymen, all, to follow some idealist inhuman dream. Too much suffering lies down that road. If any heed my advice, (don’t know why you should, I am just an old ex-SO from the Int Base who has seen too much elitist insanity to recount) I say try to stay connected and help who you can. In the long run that is what the churches and families and groups are all really all about, folks who feel for others getting together to do what they can. Wow Bruce. Thanks. Insightful and poetic. I didnt know you had other talents than being a genius electrician/sound engineer…. Should have known that a brilliant mind like yours would not be limited to one or two fields of genius. My favorite genius, very well put Bruce. I’ve missed working (suffering) with you. Mike could you give Bruce my email address please. Very nice work, Bruce. I believe you have touched upon the key to happiness here. +1! Outstanding post, Bruce. The Church of Scientology IS bereft of humanity. And what fills the void? Anger & self righteousness. There’s a whole wonderful world waiting for those who wake up! As most of us have found…. Thank you, this comment shows humanity for what it actually is, beautiful even with its flaws. If we embrace humanity and then share it the world does become better. Simple truth doesn’t cost a lot or take years of study or base itself on the teachings of one, it’s an internal spark of good that increases when combines with someone else’s. Hi Mike, I liked your piece today.My late Mom was raised in the UU church in Boston King’s Chapel,as when we went to church,were her four kids.I was named and married at KC but never joined.I agree that of all the ministers etc I have seen in religions, if I did join any church it would be UU.Very good and kind people. Being the free spirit that I am, when I do go back to Beantown I poke my head in the church and the space always feels diametrically opposed to Scientology.Peaceful and calm.Thank you.Love,Ann. What a great article. Like many here, I am done with organized religion. But, this was a nice breath of fresh air. Sheldon, what about “Unorganized Religion?” I mean, I don’t think they get much done, as they’re unorganized, but, they have a great time being that way. Yes, it was lovely, Mike. I am unwilling to become a member of any organized religion. That does not mean that organized religions are bad. On the contrary, people may be able to find the peace they are seeking not necessarily in the teachings but the practices of religion. I had a similar experience Sunday. We went to visit my husband’s elderly parents who live about 100 miles from us. They are LDS. They know we are not and we don’t discuss their Church. However, while we were there, there were knocks on the door and people from their church dropped by with food and treats. They were told “we miss you” as they have become mostly home bound and do not attend services anymore. This was a glaring contrast in a couple of ways. They are elderly and still loved. They have not been kicked to the curb because they are not able to participate or donate any more. The biggest question asked was “what can we do for you?” One person asked me why they never answered the door when they had visitors and I explained that they are both so deaf they don’t hear people knocking and could they please walk right in. This person was very alarmed by this because he had visited several times with no answer and felt bad that he didn’t understand that they couldn’t hear him and wanted to make sure they knew they weren’t alone. These visits were soothing to my husband’s parents and made me think about descriptions of visits to scientologists homes where the members knock, call, harass while the member is hiding in their home unwilling to even answer the door to these vultures. IMHO if you are a member of something claiming to be a religion and you feel the desire to hide from visitors from your church, it would be wise to reconsider what your continuing allegiance to that faith is doing for you or anyone else. Perfect summation in a sentence Val. The reason that the people from this couple’s church were so willing to help is because Mormons don’t use the tone scale which lacks the tones of love and sympathy. Latter-Day Saints do what they do because God commands us to not just love him but to love others as well and Mormons seek to live by this. Lawrence, they fundraised for Ideal Morgs at my org’s CHRISTMAS parties. I was so disgusted, even before I became disaffected. I had this idea that there could be just this ONE gathering without any money grubbing, just skits and singing carols and refreshments…um, no. Damn, a church without PIs – how bizarre. Aren’t they worried about all the fallout from ex-members? My sentiments exactly, Gadfly. Without PIs, how will they protect themselves? They could get overrun with wogs!!! WOGs!!!!!!! Without being able to track SPs down, they can’t harass them? This is just downright scary….. Sorry OSD, but her heart belongs to Davey and Davey beats her 8 to the bar. But can they always find parking spots? I don’t think so! Although I am not religious, I joined a Unitarian Universalist church in Boston. Mostly I wanted a place for occasional reflection, and a spot to sing carols on Christmas Eve. What you describe is entirely accurate, the focus was on 1) having a belief system (could be Christianity, Buddhism, Muslim, Atheism), and 2) service to the world that reflected your beliefs. Some UU churches are more Christian, the congregation decides when they choose a minister. My occasional visits were always welcomed. You’ve inspired me to find the UU church in my new location, thanks! 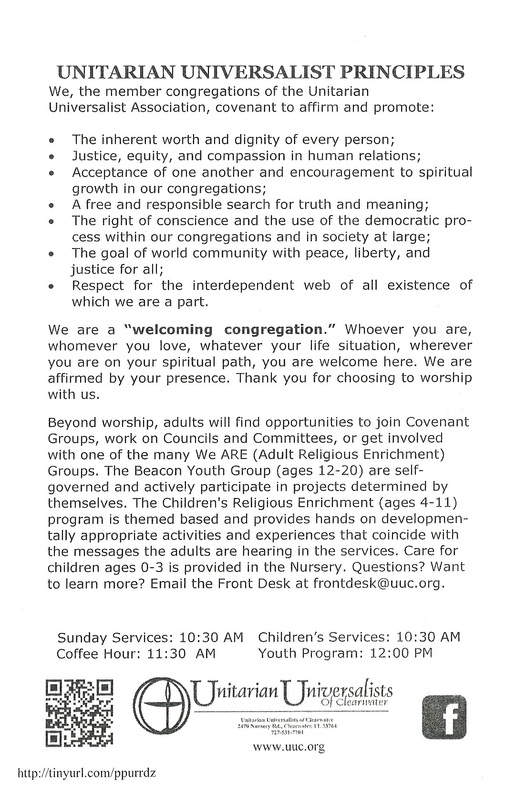 UU congregations are fairly common here in New England. The origin of Unitarianism, based on my understanding through a friend active at a local church, is the Pilgrims who landed here so long ago. Joining with the Universalists many years ago they are now the UU church, one of the more liberal churches around. A wonderful group of people in my experience. Not quite. The Pilgrims were Puritan Christians. Unitarianism originated in Eastern Europe in the 1500’s and spread to New England from England in the late 1700’s. I’m ex-SO and left scientology after 11 years back in 2012–thanks in no small part to you, Mike. I thought I was done with organized religion. Even though I missed having a group, I couldn’t imagine sitting in a church and professing beliefs I don’t hold. I had more than a decade of compromising my own integrity and it was enough for a lifetime. About a year ago, I started attending a UU church. As you said, I found it to be everything scientology claims to be but fails to live up to. I found a group of genuine humanitarians from diverse backgrounds and life experiences, but who come together to help each other and the greater community. Atheists, Buddhists, ex-Catholic refugees, and Christians can worship and work together, and without question or judgment they made room for a confused ex-scientologist. I’d encourage anyone who misses that 3rd dynamic group working for 4th dynamic change to check out their local UU church. I became an SO member because I thought I was helping–it was a severe betrayal to find out the truth. It is cathartic to now be a part of a group that is earnest in its efforts to help, even if their goals aren’t quite as lofty as planetary clearing. Yeah, it’s an interesting “processes” to place Scientology on the tone scale as to how it treats others. Furthermore, I did not see one ‘Zip!’ ‘Pow!’ ‘Ba-bam!’ ‘Zooom!’……….how do I know how to describe the feelings I get after I blow chunks, I mean, charge? It still dumbfounds me that people are actually blocked from leaving a room….having a wee bit of claustrophobia, I know what I would do in that scenario. It wouldn’t be insouciant, I can guarantee you that. I don’t want to defend anyone, but unless staff members in the US are much tougher than in South Africa, nobody ever stopped me leaving a room. Admittedly, I’m a fit buff dude (leastways I was then). Admittedly one international exec once literally collared me and told me how rude I was for walking out mid way through a local exec’s pitch for fundraising. But WTF, I still left, even though I felt humiliated. But then again, I was still in and contemplating my next six-month fix-up. Hi Dr. My personal view of the US Scn public is that they are so afraid of being pulled into ethics, being sec-checked and generally raked over the coals, that they do not cause a scene. When my wife and I were faking allegiance to the cult, so we could stay in communication with our children, we attended some idiotic briefing (regging) and after it was over, went to our car. Some wanker tried to stop me and asked where I was going and I said “Home, Bye” and walked out. It isn’t that hard actually but it depends on your level of fear one has with the cult. I must say though that having spent some time in SA, South African public can be a bit tougher than U.S. – it is a pretty tough country. You crack me up OSD! Thanks C3PO…ummmmmmm…..sorry! I mean CPO. I would like to applaud you for doing that, CPO. Being prevented from leaving (anyplace) was, and still is, a huge button for me. The corralling, the helicoptering, being hovered over, placed around, detained, God, I HATED it, and the effort of pretending that I DIDN’T hate it, that it was all fine and dandy when inside I was SO tense and resentful, made me hate it even more. Oh, how I wish wish wish wish wish wish I could have had the guts to say that, just once, just once, when I had all those opportunities…this is a real regret of mine, but I didn’t have the nerve, or whatever it took. But hats off to you, CPO for the guts you showed. I think I was only able to tell them where to stick it is because I had been away from SCN for 34 years and at this stage in my life no one tells me to do anything I don’t want to do (except my wife). It was a flag briefing, about a year ago, and I only attended because my son worked in the local org and needed to get his “bodies” in, so we helped him. I had to fill out a survey about what I liked most. It covered the key-notes of the event. I said in my reply that I like the pics of the Ft Harrison and how it was pretty and changed a lot in 34 years. That was it – nothing to do with their idiot GAT BS briefing or running around a pole or nothing. In a way, it was fun to be indignant to the little a-holes. Kind of made my glass of scotch taste better when I got home that evening. Good for you CPO. I was once in the audience at Flag when Miscavige was speaking, and had an almost uncontrollable urge to interrupt him and say something coarse and uncouth. That was the real me being suppressed. Now, nothing would stop me if I felt I was being hoodwinked. “if your experience is indescribable…. then maybe there is nothing to describe”. Amen to that! There’s nothing to describe because there’s NOTHING there. Wow. That’s scientology. There is something sinister about cults, they try so hard to be a religion because they are not one. It’s like a drug lord with his hit men around trying to pretend they are respectable OLs. A normal bona fide church has nothing to prove. No hidden agenda, no money spent on publicity or lawyers. Their deeds speak for themselves. The amount of money the cult of greed spends on PIs and fancy attorneys is an indicator of its perversity the cherry on top of the icing is when they put adds about help or human rights. I bet they only have a few lawyers that they rarely call. I’ll bet they have one lawyer, who is a parishioner and works pro-bono. Pro bono. What is he, a fan of Sunny? I like the Unitarians I’ve met in my town. To me they epitomize the true message of Jesus; Love, Forgiveness, and Interdependence. Due to some Christian sects I had become pretty sour on Christianity. Reading ‘The Gospel According to Jesus’ by Stephen Mitchell, helped clarify his teachings for me. I agree with you Mike, if I was going to join a church it would probably be their’s. Question – Would a Unitarian Church (essentially members therein) feel that you should be “saved”? Hi Richard, Let me see if I can help with your question. In my UU experience growing up, there was no talk of being saved at all. Service to fellow men and women and living the words of Jesus but with no push to be anything within the church but yourself. The church in Boston I was raised in but never joined is known as the mother church of UU.King’s Chapel. So one might ask, why did you join Sea Org? Because I have always been a seeker and although the UU was a safe harbour for a time in childhood, and teen years,the wild unknown always called me.Love,Ann. Esther and Ann – Thanks for your replies. I’ll check it out. Sounds interesting. As a non Christian I wouldn’t want to be counter intention but yours and others comments seem to say that’s not a concern. Ann – As younger folks sitting in any church seemed lame – laughter. Scio had the lure of super power and unique newness. And who else used magical e-meters? Hi Richard, Thank you for your interesting reply.I am not a member of any Christian church.The UU was a big part of my late Mom’s maternal grandmother’s life who was from Salem, Mass.As an aside on her side my something times great grandma was executed as a witch in Salem.Her name was Rebecca Nurse. Those magical e-meters! Where would I be without those shiny cans and psychotic needle swings!! Love, Ann.Hated church of any type when really young.Except the ultimate con cos.Till I wised up. Laughter! Plus very interesting. My grandma was a devout Methodist but also followed astrology. “God created the universe so we can contemplate and admire it.” or something like that. She also promoted health food supplements in the 1950s. Some kind of seaweed blend as I recall. Vinegar cured most anything from her viewpoint. She told me that angels helped her and, if I wished, they would help me also. Hi Richard, Thank you for another interesting post too.Your Grandmother would have loved my mother in law who just passed at 961/2. She was a devout Episcopailian, loved astrology believed always in angels and vinegar was her weapon of choice and she never met a pill including aspirin she would willingly take.Laughter she was a character.Love, Ann. I had a similar experience while attending a secular function inside a rented hall at a Episcopalian Church in a major city. There were hundreds of people in attendance at the event (which was non-religious) but all of the catering, support and staffing for the event were handled by church employees. They could not have been nicer, friendlier or more interested in seeing that the event was successful. It was an eye opening experience because it reminded me of the purpose of a church and how they can truly serve a community…for real. Glad to read about your experience too…there are many, many fantastic people in the world…the folks still inside Scientology would almost certainly be delighted to meet these other folks and bask in a friendly, welcoming environment. Good Mike. I did a similar thing,as part of my effort to evaluate all data of comparable magnitude in the known universe and complete my cycle of learning, to not be a parrot and get my own “UNDERSTANDING”. I did a lot of different things and read a lot of different books.with a critical mind, for different perspectives ( and to glean useful data) and looked at and studied and evaluated life and people (families and individuals of all parts of the tone and theta scale, the whole sector of society) for myself.. That is the point LRH made in Scientology: A New Slant on Life, ch; How to study a science. You are now doing scientology right. Hey Dio .. big words ..
To be honest, only one of the words was big. The rest were normal. “Big word” is probably more appropriate ..
Scientology CANNOT be like a church, it is NOT a church and NOT a religion 😉 because it is a business. And a very fraudulent one at that. Gosh, I always thought it was a crime syndicate. I remember scientology was described as a cross between the Moonies and the Mafia. You mean they do what they SAY they do, unlike our scio members? Isn’t that a lovely change to observe. Nice piece, Mike. I’ve been in such churches and delighted in the services. Religion without force, condemnation or sales. I’d say that it’s 10K times more effective in life than scio, except that 10k x 0 is still 0.